We are all about getting the most from your home here at Geri Reilly Real Estate, so what if you could not only live in it but EAT IT, too! 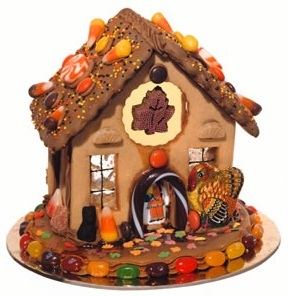 Gingerbread houses are usually reserved for Christmas festivities but a sweet Thanksgiving house of confection makes a great center piece that the kids can help make. Follow this simple recipe to "build the home of your dreams" - or the dreams of your sweet tooth, at least! You can use pre-made gingerbread dough, or even pre-made gingerbread "walls" - to construct your home with. Check out a great recipe for making your own from scratch right here. Once that's done, it's time to make the icing "mortar" that keeps your house together. Again, you can purchase this but it's a lot more fun to make your own! To do this, simply blend ½ cup liquid egg whites (safer than raw eggs), 2 2/3 cups powdered sugar and ½ teaspoon cream of tartar until the icing forms stiff peaks. If this does not occur after about 6 minutes, add some more powdered sugar. Feels like home! Sweet, delicious home! Now your icing is ready to go! Put a damp towel over the bowl icing if it starts to dry out while you're working with it. It is best to build your "home" over a sheet of wax paper to prevent sticking. Join the walls together by first drawing a thick line of icing on one end of the wall and then sticking the adjoining wall onto it. Seal them together with another layer of icing on the outside and inside of the two adjoined pieces. Repeat for all 4 walls and the roof. Once the house is constructed, it's time to decorate! Draw on windows , doors and shingles on the roof. Decorate with fall-themed colors and candies like orange and red decorative icing, candy corn, orange gum drops, leaf shaped cookies, Reese's pieces, and pumpkin shaped Mello Creams and jellies. Mini leaf shaped sprinkles look like fallen leaves on the ground. The possibilities are endless! As fun to look at as to eat, a festive fall gingerbread house is an unexpected treat on your Thanksgiving table. Now when you're ready to build the real thing, or just want to show off your confectionary creation, get in touch with us! Many homes fall flat against the beautiful foliage of fall. You want yours to be the pride of the neighborhood, catching the eye of everyone who passes by and being the envy of all your neighbors! Bringing a new, updated look to the outside of your home doesn't require expensive renovations or construction projects. 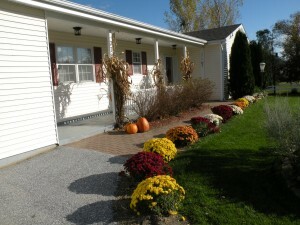 Here are some tips for amping up your curb appeal this season! Indulge in a little fall cleaning and give yourself a clean slate to work with. Rake out those leaves and weeds and remove outdated planters or thingamabobs around your lawn and stoop. Now doesn't that feel better already? Beautiful and easy! Click for for info on this home! You don't have to wait for your perennials to come back around, garden stores and even grocery stores are selling blooming beauties right now! Plant blooming flowers with a little mulch and water and you will have eye-catching curb appeal now that will come back next year. And if you're feeling exceptionally industrious consider planting bushes or trees. They will take a while to reach their full potential, but it's a nice weekend project with a lasting impact! Just make sure the bushes you choose do not grow above 3 or 4 feet for easier maintenance. You could go all out and paint your whole home, but if that's not already in your immediate plans then try painting a few key features on your home. Columns, eaves and shutters are quick and easy to paint. If you have a unique feature on your home you'd like to highlight, paint it a neutral but contrasting color. Or try a nice warm brown paired with a welcoming blue door, then hang a gorgeous wreath on it for good measure! 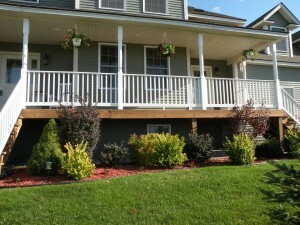 Now that your yard and stoop are all cleared and clean, re-imagine the image of your home. Put out 2 simple benches on either side of your door for a welcoming retreat. Place a few pumpkins, planters with flowers or fall themed décor for seasonal appeal. Change out those old house numbers for some new ones, they're affordable and add instant charm to your home. Think minimalist and colorful for classy, attractive curb appeal. It doesn't take a lot of time - or effort - to maximize the attractiveness of the outside of your home and it will give you a wonderful sense of pride when you turn the key. A few splashes of paint and a dash of accessorizing will get you in the mood for fall in no time, and don't forget the welcome mat!